WHY U SO EXCITED BOUT IT PEOPLE? okay it's my problem cuz i only get excited bout the food. I dunno why recently all my new blogpost was kinda random and bored. Even myself wanted to puke when i read . Just wanna update abit today. I had my first online food ordering from DOMINO'S PIZZAAAAAAAAAAAAAAAAA today! And it's totally awesome cuz i dunno why i get so excited like a child. Cuz cuz cuz i order myself and and and and and cuz im paying it and nt from my parents? i noe.. im pretty lame.. I guess my friend thinks im over crazy of waiting the delivery. 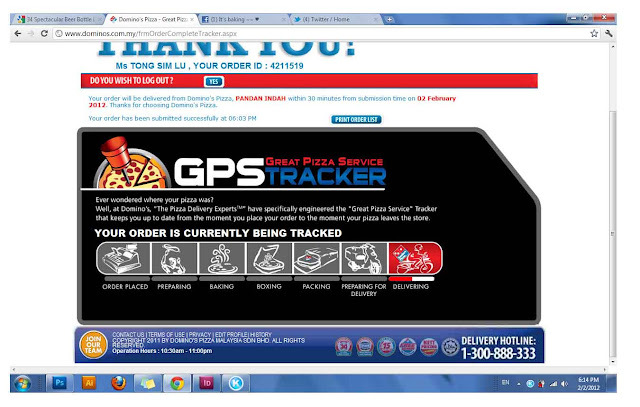 You noe how cool to see the tracking of where's my pizza had been through? I keep staring at the GPS tracker..
and im sure u ppl will be like wtf? so at the end the delivery man got lost all the way to my house and have to call me for the way. Anyway nice service they had ! I ordered the Tuna one cuz i love tuna and pineapple and only cheese on my pittzaaaaaa.. Yes pitttzaaaa i mean pizza or whatever.